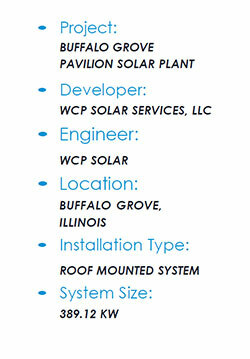 WCP Solar was contracted to design and construct a roof mounted solar system on a building hosting a skating rink, located in Buffalo Grove, Illinois. This grid connected system ties directly into Commonwealth Edison Utility’s (ComEd) power grid and generates enough electricity to provide power to more than 23% of the facility electrical needs. 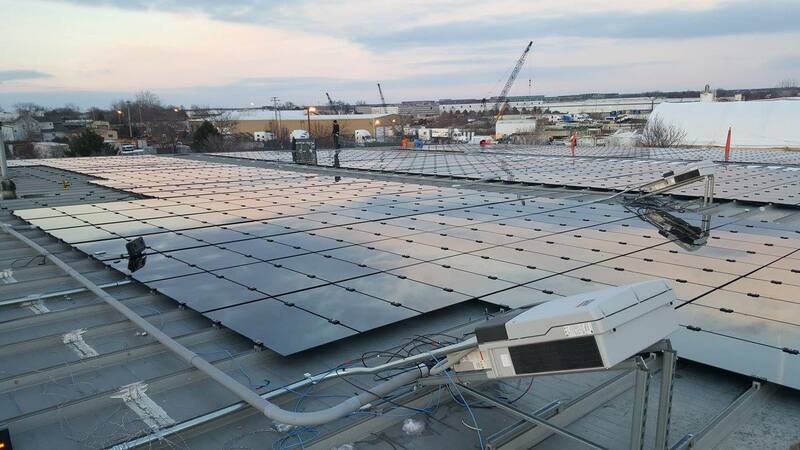 The project was sized at 389.12-kWp1, using 4,864 CdTe Thin Film frameless photovoltaic panels rated at 80-W mounted on a 4 degree tilted metal roof. The system also employs 16 string inverters, each rated at 24-kW, to convert the DC energy produced by the solar plant into AC energy. In addition to providing significant energy savings, the solar system will produce approximately 454 Solar Renewable Energy Credits (SREC's) and also qualify for significant federal tax credit. It is estimated that based on the incentives received by the company and the energy savings being experienced, the system will be paid off within 3 years from the date of commissioning. The project was commissioned within 6 months from issuance of the construction permit while the WCP Solar construction management team oversaw all phases of the construction process, including the day to day operations, weekly subcontractor, and Owner meetings, site monitoring, quality assurance and control, and scheduling. Completed on February 1st 2016, this project was another example of strong design management and project leadership by the WCP Solar team. 1 Estimated reduction of over 10,000 Tons of CO2 - Equivalent to planting over 217,000 trees or displacing CO2 emissions from the annual electric use of over 1,050 homes.